Cisco Networking Academy Program CCNA 1 and 2 Lab Companion, Revised Third Edition, is the complete collection of labs created for version 3.1 of the Cisco Networking Academy Program CCNA 1 and CCNA 2 web-based courses. A collection of more than 100 labs, including the Case Study labs from the CCNA course, provides you with hands-on experience to practice the skills needed for CCNA certification. The material begins to prepare you to take the CCNA certification exam (640-801, or 640-821 and 640-811). Keep your completed labs on-hand in this book to use as a study guide later. 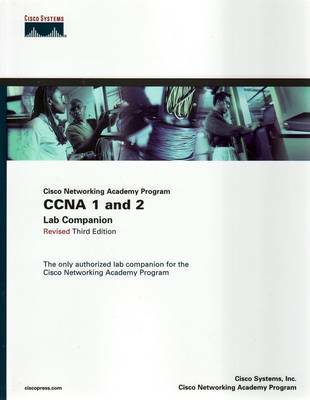 These labs are also referenced in the Cisco Networking Academy Program CCNA 1 and 2 Companion Guide, Revised Third Edition. Objective-Identifies the goals that are to be accomplished in the lab. Background/Preparation-Provides a list of the equipment needed to run the lab. Reflection Questions-As appropriate, the labs include questions that elicit particular points of understanding. These questions help verify your comprehension of the technology being implemented.